Smartphones these days are expected to have biometric security: official fingerprint sensor, which has become a common feature in phones. This feature not only locks our phones and provides security, but also prevents others from viewing the contents of the phone. But what if you want to hide data and apps that you don’t want others to see even when our phones are unlocked? Basically, we use authentication method like a password or pincode to lock the apps. While there are some apps that provide extra extra coating of security, but what happens in case the app you use doesn’t have security. Enter AppLock -Fingerprint-, which gives you access to those apps by using the fingerprint scanner. 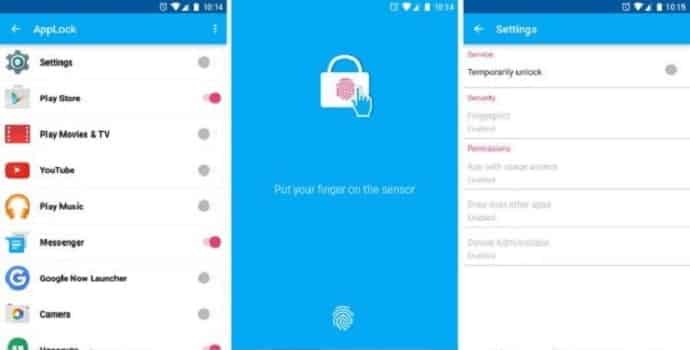 This app will lock and secure your apps that only you can unlock using your fingerprint. All you need to do is enable AppLock and this would prevent people from opening your messenger apps like WhatsApp, Hangouts, LINE, Skype, etc. Whenever you launch the said app, you will be greeted by the blue screen in the middle asking for your fingerprint. The app looks quite nice with its Material Design UI. Further, the good news is that the app is free. However, the flipside of the app is that it uses ads for revenue, and there’s no current way to get rid of them with an in-app purchase. However, based on some reviews of the app, you can pay to remove the banner ad. If you wish to get your hands on AppLock, go to Google Play Store for the download. However, in order to use it, you will need to have a device that has Android 6.0 Marshmallow and a fingerprint scanner.